This is the second dog I’ve seen with presumed immune-mediated thrombocytopaenia treated with high doses of prednisolone which developed marked hepatomegaly accompanied by significant volume of ascites. Both cases received a total daily oral prednisolone dose of 4mg/Kg and developed ascites consisting of modified transudate within one week. 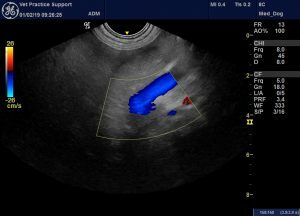 Sonographically the liver was markedly enlarged and diffusely hyperechoic in both cases. No alternative cause of effusion was identified. Neither dog was hypoalbuminaemic; echocardiographic findings were unremarkable with no dilation of the abdominal cava. 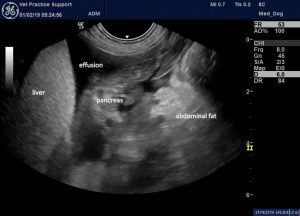 I find that the portal vein is often hard to visualise well in dogs with significant effusion due to the difficulty of getting the probe head close to the porta hepatis when the abdomen is tense and distended and the abdominal fat is hyperechoic due to the effusion. However, there was no obvious evidence of pre-hepatic causes of portal hypertension such as portal vein thrombosis. J Pediatr Gastroenterol Nutr. 1986 Jan;5(1):41-6. Hepatomegaly following short-term high-dose steroid therapy. Iancu TC, Shiloh H, Dembo L.
It seems plausible that intrahepatic portal hypertension might result; and this would obviously be a potential cause of ascites. The first of these two dogs was eventually euthanased due to uncontrolled bleeding. 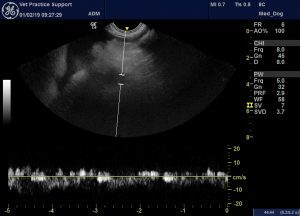 The present case recovered uneventfully within a month with complete resolution of ascites within a week of tapering down the prednisolone dose and, at the time of writing, remains healthy without any drug therapy.